Brenda died on Wednesday 24 February in the Phyllis Tuckwell Hospice in Farnham. Pam, her life partner, slept in the Hospice and was at her bedside for the final hours of Brenda’s life. Brenda was an amazing person, an evangelical Christian with a passion, and a key member of the Changing Attitude team. She was a campaigner and fighter and was always totally committed to whatever she became involved with. Brenda became involved with Changing Attitude in the early years and was instrumental with others in creating a strong, independent LGBT Anglican witness. She worked half-time for Changing Attitude for 3 years as administrator and continued to work unpaid with the same commitment until a few weeks before she died. She had also become a trustee and ensured that we adhered to all the legal and financial rules. Changing Attitude wouldn’t have been organized with such efficiency and we wouldn’t be in such a stable financial position without Brenda. But more than her practical skills, Brenda brought her cheeky smile and a bouncy attitude to meetings and events. She was involved with many other groups, had been a president of the European Forum, a member of the Evangelical Fellowship, CA convener for Guildford and a member of the Human Sexuality Group in Guildford Diocese. She had many more irons in the fire, all of which helped her cross boundaries and form friendships with a huge network of people. Brenda was an inspiration to so many and we all have so much to thank her for ~ a determined fore-runner who campaigned for many of the things some now enjoy and take for granted. Brenda wanted the campaigning to continue until all are able to enjoy freedom in the Kingdom of God. Her inspiration and love touched many of us over the years. Freedom at last on Earth and the other venues of the Kingdom of God too...well done, Brenda, thank you, you have helped us find our way. So sad to hear this. Thoughts and prayers are with Pam. She was very kind. I will miss her. I give thanks for Brenda's life and work -an encouragement to so many in the lGBT communities and a stalwart supporter of Evangelical witness. I am so sorry. Brenda was such a lovely, caring, down-to-earth, precious daughter of God. I thank her so much for her kindness to my son and his husband. I know she is now in the warm loving embrace of her maker, our father, God. 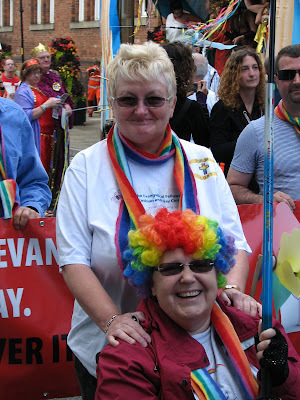 Brenda's good humour, enthusiasm and passion for the LGBT Christian cause were what I will remember most. I thank God for Brenda's ministry and pray for Pam in her great sorrow. It was a privilege to work with Brenda at Lambeth 2008, and she certainly made sure that all of us from overseas were welcomed and well housed. Thank you all for your kind words. Brenda was as courageous in her illness and her last days as always. I'm glad to read this, and to see the great photo. I can't be at the funeral on Friday but I'll be thinking of you all and I hope Brenda is given a great send off. I have many memories of Brenda at LGCM events. She was an activist and a pioneer. Watch out heaven -- that's great!